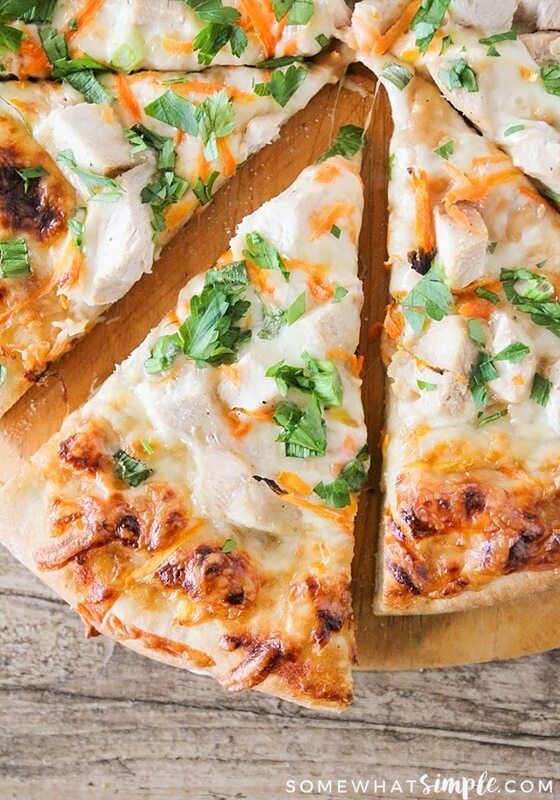 This savory and delicious thai chicken pizza is simple and quick to make, and bursting with flavor! My husband is a pizza fanatic. Whenever we have a discussion about what to have for dinner, pizza is always his answer. A few years ago, I learned how to make my own fantastic homemade pizza. I think at this point, we like it better than delivery pizza! 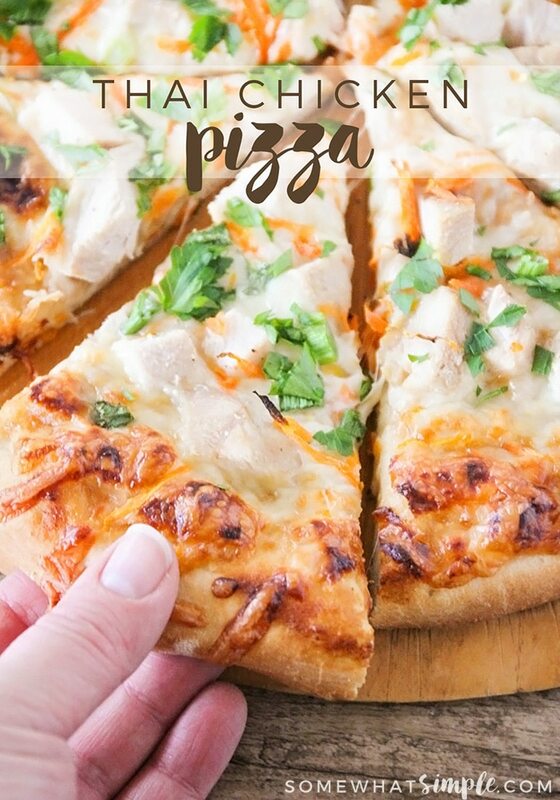 I’ve developed a delicious homemade crust recipe that’s always chewy and crisp, and we’ve had fun experimenting with different flavor combinations. 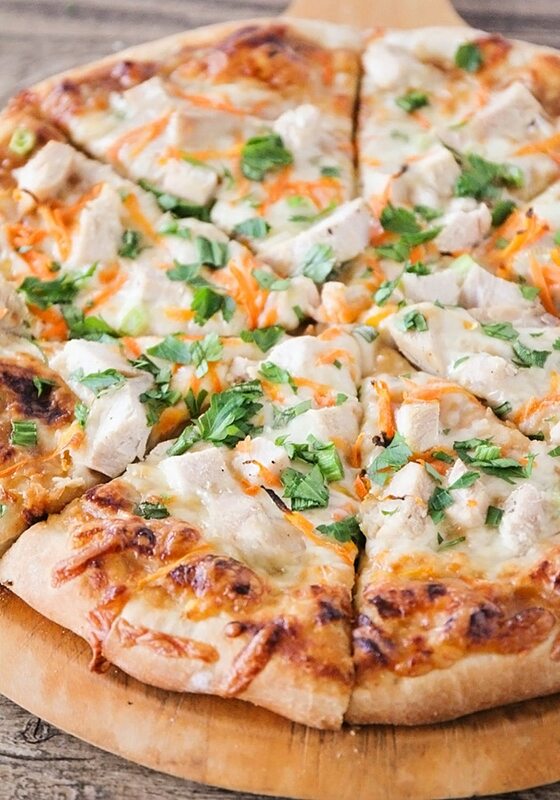 This thai chicken pizza is unusual and fun, and one of our favorites! It’s mild enough that our kids (who have almost no spice tolerance) enjoy it, but flavorful enough for my husband and I to love it too. I think the key to this recipe is the amazing thai peanut sauce! It adds so much flavor, and it’s the perfect balance of savory and sweet. At first I was a little skeptical about combining the peanut sauce with the mozzarella cheese, but I was pleasantly surprised by how well they work together. I added some fresh grated carrots, green onions, and cilantro on top of the pizza, and they gave it a nice fresh flavor. 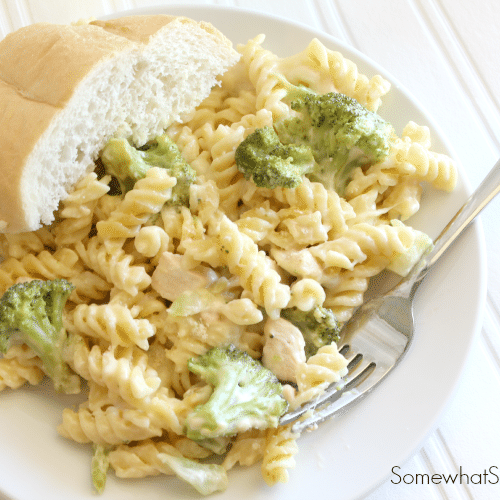 The great thing about this recipe is that it takes less than an hour to make! If you’re using store-bought pizza dough, it’s ready in less than thirty minutes. 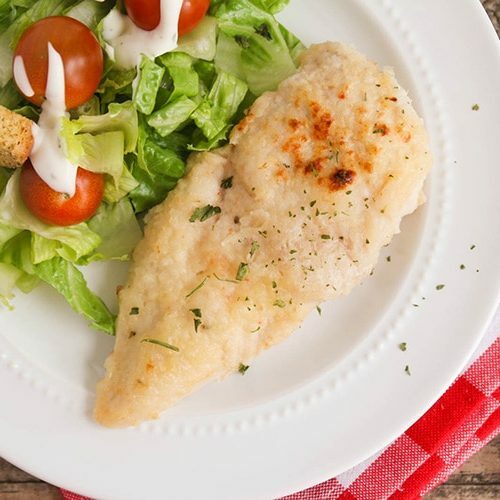 It’s perfect for a busy night when you still want an extra delicious dinner. 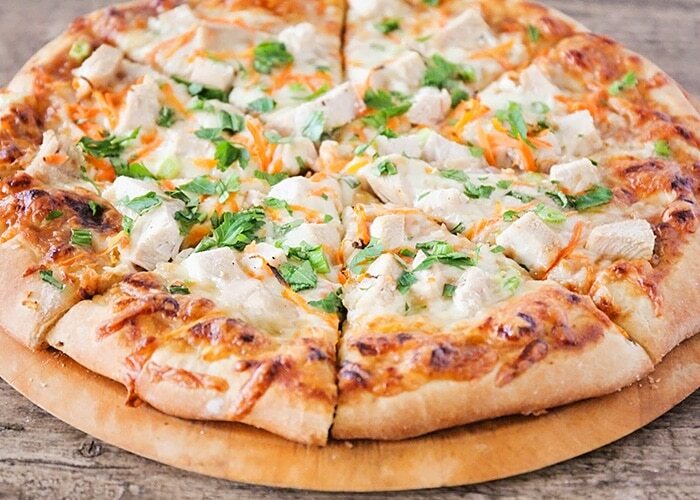 We eat homemade pizza at least once a week, and this is definitely one of our favorites! Add all sauce ingredients to a small saucepan over medium heat. Heat, stirring occasionally, until the sauce bubbles and thickens. Remove from heat and let cool. Preheat the oven to 475. Heat a baking stone or overturned cookie sheet in the oven as it preheats. Roll or pat the dough into a large circle on a sheet of parchment dusted with cornmeal. Spread the dough with the peanut sauce, leaving a one inch perimeter around the edges. 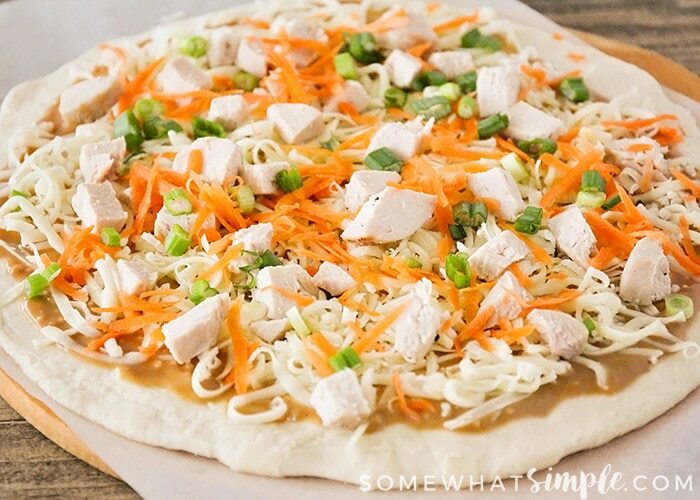 Sprinkle with the chicken and top with the cheese, shredded carrots, and green onions. 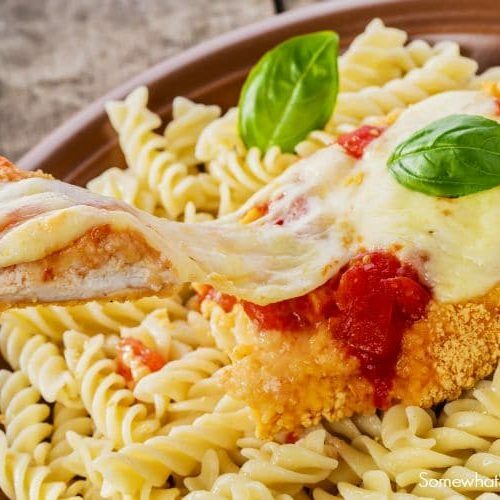 Bake 8-10 minutes, or until the crust is golden and the cheese is melted and bubbling. Remove from oven and sprinkle with chopped cilantro. Serve hot.